At each step in your funnel, you’re at a different stage of the customer journey, each managed by a different team. When customers are at the top of your funnel, marketing reigns. Then prospects get passed to the sales team for conversion, before the customer success team takes over to keep them happy in the service. But often each team isn't interested in a customer until they fall into their lap. The CS team doesn't care about who sales is converting until they are converted, and sales doesn't care about the prospects marketing acquires until they have the leads. This lack of alignment throughout the funnel creates serious inefficiencies that could tank your business. It means your customer acquisition cost (CAC) will be too high, your customer lifetime value (LTV) too low, and that no one is working to optimize these numbers throughout your business. That's why you absolutely need to quantify your buyer personas. With purely qualitative buyer personas, you have a description of your customers, but you don't have a process for nailing down their economics and an actionable basis for replicating them. By quantifying your buyer personas, you'll feed a constant stream of data on each of your customer types to the entire business so everyone knows their responsibilities, gets on the same page, and feels empowered to act to move the company towards the same goal. 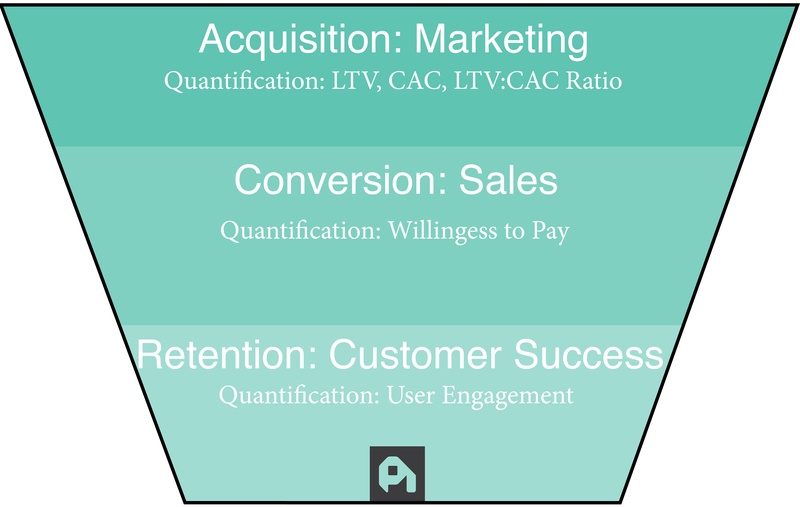 "Buyer Personas = Qualitative data + Quantitative data - Assumptions"
Your marketing team will be tracking customer acquisition cost (CAC). It costs money to acquire each and every customer, and how much depends on 2 factors: the type of customer you want to acquire, and the channels you’re using. But CAC isn’t one single number. Your CAC is amalgamated from multiple personas across multiple channels. It doesn’t make sense for you to track just a single CAC, because it can vary wildly from buyer persona to buyer persona. If you have buyer personas split across startups, mid-size businesses, and enterprises, each of these are going to have a different CAC. The startup persona is likely to be self-serve and need less decision time than an enterprise client, where there will be multiple stakeholders requiring significant high-touch sales work. If you were to treat these two CACs the same, as a single monolithic number, then you will be trying to optimize your CAC for a persona that doesn’t exist. Instead, if you quantify your buyer personas, parcelling out the separate CAC numbers to each persona, you can optimize according to these personas and bake this understanding directly into them. Not only does it help the marketing team control the CACs for each buyer persona, but in terms of aligning the funnel, it also helps your sales and customer success teams perform better. It lets them control their own metrics—willingness to pay and LTV—around the CAC and know with which parameters they are working. By splitting up CAC by buyer persona, you can start to easily see if your acquisition spending is working in your chosen channels. 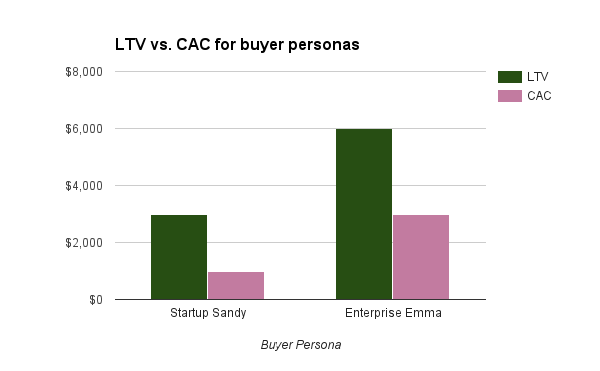 The CAC for the Startup Sandy buyer persona is just $1,000, low compared to a $3,000 LTV. This immediately shows that you’re on the right track and that you should continue in this channel for this specific buyer persona. Anything where the LTV:CAC ratio is 3:1 or greater and you know that you are making real revenues from that type of customer. You can even double down on this channel, upping your spend to draw in even more customers from this one persona. However, a CAC of $3,000 is too high for Enterprise Emma, with a corresponding LTV of just $6,000. This puts the LTV:CAC ratio out of whack, and the revenue won’t be available for stellar growth. A ratio of 2:1 is a warning that you’re not using the right channels for this persona and that you need to find better channels to reduce your CAC. On the other side of your funnel, your sales and customer success teams will see that your LTV:CAC ratio for Enterprise Emma is off and they'll know that they need to drive up LTV to make the SaaS math work out. According to MarketingSherpa, “61% of B2B marketers send all leads directly to Sales; however, only 27% of those leads will be qualified.” Marketing is often all too eager to pass along leads as an indicator of their value without qualifying those leads, especially for ability and willingness to pay. Because of this incongruity, it can be near impossible for your sales team to maximize the deal value of the customers with whom they are in contact. The leads passed through the funnel from marketing are all wrong, and they can’t optimize their sales process while also having to weed out these unqualified leads. The size of the deal your sales team is putting together is an integral part of your LTV. The bigger the deal, and the longer your sales team can tie them in, the greater your LTV is going to be for that particular buyer persona. But if you don’t have a quantified number for willingness to pay known for each buyer persona, your sales team is going to be unsure about what to pitch and could end up lowballing potentially large clients. With quantified buyer personas and an understanding of the LTV level for each buyer persona, your sales team can maximize the revenue from each deal and know they are getting value for the company and the client. Quantify willingness to pay and put it in your buyer personas, and you'll get marketing and sales on the same page, reduce wasted sales time, and drive up customer LTV. Enterprise Emma is a large corporation, willing to pay $100,000 annually as part of a long-term, 5-year contract. Though Enterprise Eddie is also a large company, he doesn't want to be tied down to a long-term contract, and prefers a shorter time period. He is also willing to pay $100,000 but only for a year at a time. These two buyer personas might be qualitatively indistinguishable, but quantitatively they are very different. They will require a substantially different sales technique to sell either a 1-year or a 5-year contract. 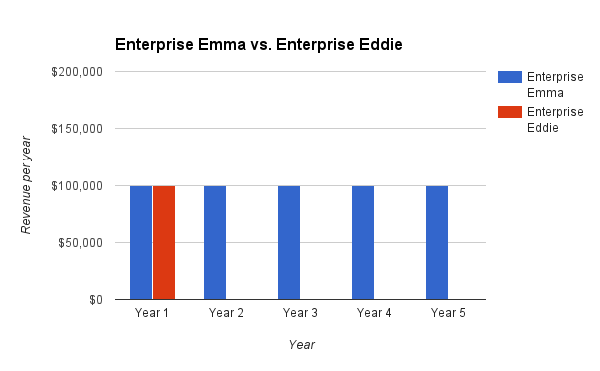 Whereas Enterprise Emma wants a 5-year contract, by pitching a 5-year contract to Enterprise Eddie, your sales team is missing a $100,000 opportunity and will be unable to close the deal. 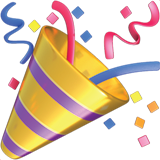 Conversely, pitch a 1-year contract to Enterprise Emma, and you're leaving $400,000 in customer LTV on the table. By separating these personas out, your sales team will find another possible customer and be able to target a specific offer to them the moment they are in the funnel. The quantification of your buyer personas can help you way beyond your funnel and into the active life of your customers. Your customer success team can also use these quantified buyer personas to help retain active users within your service. 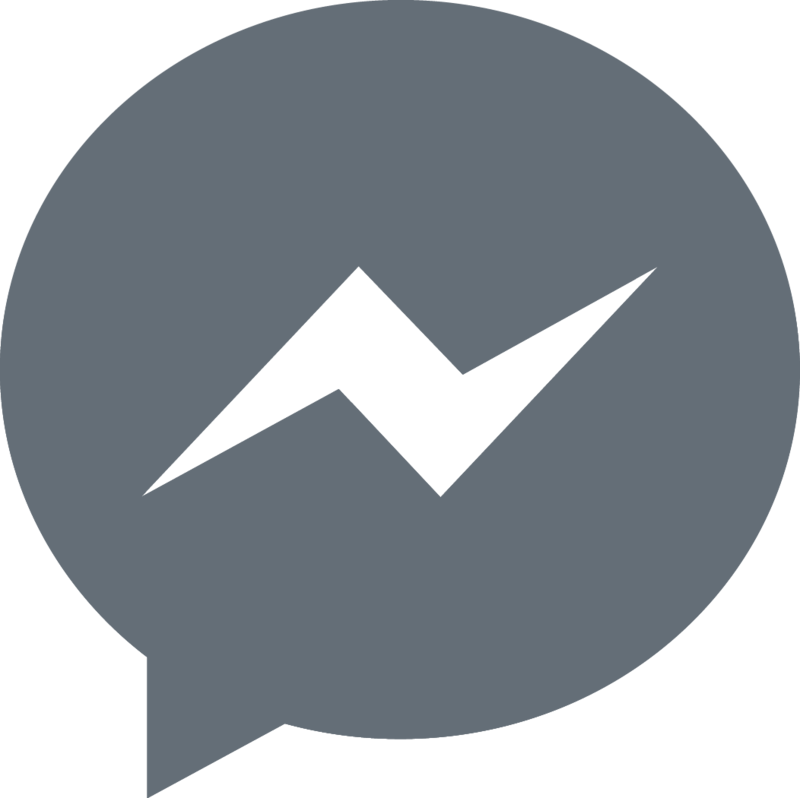 Rates of engagement are going to be different for each of your buyer personas throughout their customer lifetime, and by adding these to your buyer personas you can use them to automatically flag any engagement issues different types of customers might be having. When you know the expected rate of engagement of the different buyer personas, you'll know exactly when users are slipping away and need a reach-out. You can better use your customer resources instead of chasing down every little issue — you’ll automatically know whether any drop in engagement is a serious issue or not, and whether your customer success team should be interacting with the customer. This helps with the entire team effort as well. All too often, sales is eager to land the sale, and doesn’t think through the entire customer lifecycle. They don’t consider how the customer will use the product, their engagement, or their likelihood of renewal or upgrade further downstream. By tying these rates of engagement into your buyer personas, your sales team can consider each customer’s use case even before they get to use the product, qualifying them properly and helping with customer success immediately. Startup Sandy, a CEO running a one-woman show, might only use normally use the service twice per week, whereas Marketing Martha, a CMO at a sizable company, normally logs in each day. You can set warning points for each buyer persona so that if their usage drops below this point for any length of time, it’s flagged and your customer success team can reach out to get them using the service again. 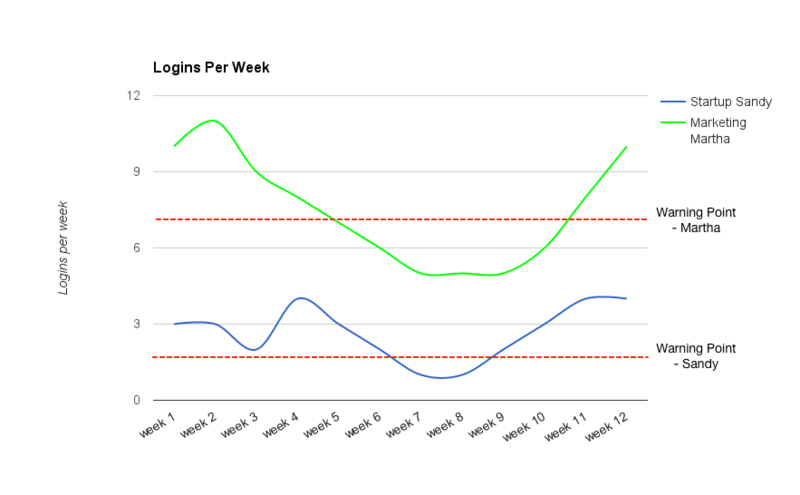 Sandy’s warning point may be 2 logins per week, whereas Martha’s is 7 times a week. When Martha drops below this point, it will be immediately clear to customer success that something’s wrong and that they need to reach out. All too often, buyer personas are static documents you write once and glance at occasionally or stuff in your internal wiki, never to be seen or used again—while the real live data that drives the organization lives within silos in functional groups. Quantifying buyer personas means getting those key metrics out, segmented by the key customer types that power your company and in a live document that's visible to everyone. Do that, and you might be surprised to find that it's about getting your people on the same page—more than any other “growth hacking” tactic—which will optimize your funnel and drive growth.